Candice: Phil and I love a good ‘sunlounger read’. I.e. something that does not tax the mind but whiles away a few hours while taking you to another place. Pure escapism. They are often the books that get picked up at the airport, just as you making your way to the plane and finally thinking about the relaxation you are going to get on that break (kids club anyone?). You don’t want educational text, you don’t want War and Peace, you just want to be transported for a few hours to somewhere different and forget about the day to day drudge. It’s ironic really that you often read these on a break, considering that you are somewhere that you should be escaping the drudge anyway. The Kate series is written with this in mind, something that you will enjoy reading, perhaps discuss with the other half but then give to someone else and moves on to the next one. I’ve been raiding our local charity shop recently for books to read, I’ve got a bit more time on my hands which means I’ve been racing through a few more reads (probably when I should be writing!). Poor Phil gets the remainders every time we see each other, good job he carries a sensible rucksack rather than my rather less sensible bag fair. 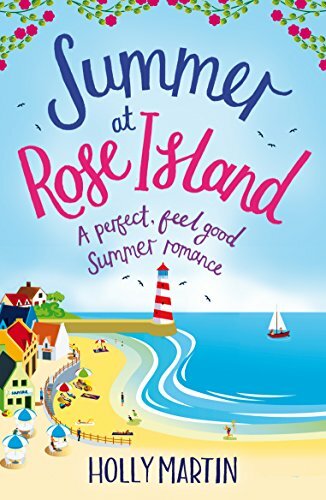 Anyway, in my riffle through the books, I came across this very chick-lit fair, “Summer at Rose Island”. The story follows Darcey, who’s moved to a quiet Devon town to escape her disastrous history of jobs. She has lovely memories of summering there with her Aunt, so hopes by running away to the town she can get away from her overbearing parents and the fact she seems to get sacked from every job. On her first day, she swims over to the island surrounding the local Lighthouse, and is promptly shooed away by its owner, a burly but attractive American called Riley. Of course, you can guess what happens next, she and Riley have a few run-ins and then fall in love. Luckily that happens early in the book, else it would have been boring. The main thrust of the story is more around the job she has come to work on, something this is not really aware of until she starts. Recruited as Community Liaison, her job is to support the Council in knocking down the lighthouse, something that she has been trying to prevent in the two weeks before she starts her new job. It is to be replaced with a luxury hotel as a new lighthouse has been built. But it is also the focal point of the town and Riley’s family history, as his grandfather originally funded and built it. Suddenly she is in conflict with him and the town and back where she started, about to be sacked from another job. The most interesting part of the book to me is her insecurities. What we actually get to the bottom of is that she trained as a Marine Biologist but left her favourite job due to a silly mistake. Lacking in confidence as her parents and brother are all medical doctors and see her PhD as something frivolous, she bounces from one job to another. We never understand why her parents feel like that but when she finally stands up to them it does make you do a little punch in the air. It’s her marine knowledge that saves the day, in a slightly trite way but hey this is a chick lit book. Both Phil and I raced through the book, what I actually enjoyed was the scenery as much as the story. I love the seaside and the pictures in my head of a sleepy seaside town made me dream of where I’d like to retire to one day.